The most inspiring session I attended at last week's Tools of Change conference was by Bob Pritchett, President/CEO of Logos. What was so special about Bob's presentation, "Network Effects Promote Premium Pricing"? Two words: content and value. It's causing me to stop looking at individual ebooks and start thinking much bigger. I downloaded the Logos iPhone app during Bob's talk so that I could have a better feel for what he was describing. You might think it's nothing more than an ebook reader like Stanza but there's more to it than that. It comes with a number of books built in, including a few Bibles. If you're using one translation and you wonder what the same verse looks like in another translation, just touch the verse number, select one of your other Bibles and the app takes you right to that same verse. Seems pretty simple, right? That's just the start. Curious to learn more about a person, place or word in the Bible? Just touch and hold and the Logos app lets you search for it throughout the Bible or in a seemingly endless list of other Logos products. This is the "network effect" Bob referred to in his session's title. You start reading the Bible in the Logos app but before you know it you've hopped to several other resources, clicking from one link to the next, learning more and more along the way. It's similar to when you start researching something in Bing or Google and a couple of hours later you realize you're 20 links deep; you have no idea how you got there but every link has added to the journey. When was the last time you had that feeling with an ebook or app? Have you ever had that feeling in an ebook? I haven't, and that's because most publishers are just selling an individual ebook, not a network of content. What makes the Logos product so powerful is that they've spent a lot of time curating their content, building links across products and thinking about how their customers can get the most out of it. They're not selling individual titles as much as they're selling access to their larger service. That brings me to "value", the other key takeaway from Bob's session. It's important to note that this isn't just a bunch of related books that have been slapped together. Logos has taken the time to leverage the content, add value and build on the network philosophy. Most publishers are complaining about the $9.99 ebook model but Logos is doing something about it. They're offering their content in a manner where the total is far greater than the sum of the parts. You might think this is a model that only works with reference content that doesn't change over time. You'd be wrong. The "total-is-greater-than-the-sum-of-the-parts" model can be applied to just about any type of reference, how-to and even fiction material. And when it is, the resulting product has far more value than what you get from a quick, standalone print-to-e conversion. Download the Logos app, spend some time in it and see if you don't agree. It's time to stop thinking about standalone ebooks and focus more on the larger network product opportunities. Over the past 9 months I've gone from being somewhat of a McCain fan to more of an Obama supporter. I'm convinced a McCain administration will be nothing more than a third term of George W. Bush and, yes, I'm looking for change. I'd like to see more substance behind the "change" Obama always refers to, but I'm also curious about his religious beliefs and the journey that led him to Christianity. With that in mind, The Faith of Barack Obama, Stephen Mansfield's latest book is right up my alley and it didn't disappoint. As you might imagine, Rev. Jeremiah Wright is a person who pops up frequently throughout this book. Prior to reading Mansfield's work I considered Wright nothing more than an unfortunate footnote from Obama's past who managed to surface at the wrong time. This book caused me to look at Wright and Obama's relationship with him in a completely different light. I still feel Rev. Wright was an overzealous minister who didn't do the best job of emphasizing the right aspects of the key points he's tried to make over the years. Exhibit A is all across YouTube, for example. And as a white person who's never attended Trinity United my comments are easily dismissed by Wright supporters. Nevertheless, I feel he crossed the line too many times, so shame on Obama for not parting ways with Wright many years ago. I don't plan to run for public office but I'd quickly move on from a church/pastor who regularly expressed such a twisted view of the world. The fact that Obama stuck with Wright for so long really does say a lot about the senator, I'm afraid. But what benefit was Wright expecting when he's spewed that sort of venom anyway? He's so full of anger and lacking in forgiveness....gee, maybe he ought to read The Shack! The bottom line is Rev. Wright probably pictures himself as a modern day Martin Luther King, Jr. He isn't though, and time will easily prove this point. If Rev. King were in Wright's shoes today I'm quite convinced he'd take a much more diplomatic approach and would be more embracing and far less antagonistic. The Faith of Barack Obama isn't just about Rev. Wright though, of course. The book does a great job taking the reader through Obama's youth, exposure to multiple religions and how he eventually become a Christian. It also exposes some of the warts in Obama's beliefs, including coverage of how he voted against a bill to protect the lives of babies who managed to survive late-term abortions. Wow, how heartless must you be to vote against something like this?! One of my favorite parts of the book was chapter 5, Four Faces of Faith. The author uses this chapter to contrast and compare the religious beliefs and paths of Obama, George W. Bush, Hillary Clinton and John McCain. At first I felt this was nothing more than filler but I have to admit it's fascinating to look at all four of these political heavyweights through this sort of lens. Finally, I think Mansfield very effectively captured Obama's critique of George W. Bush with the following excerpt: You rose on the strength of a vicious use of faith. You then baptized a greedy conservative agenda and called it God's will. Along the way, you labeled us Democrats as somehow antifaith. Now, your political faith failing you, your religious base abandoning you, it is time for you to go away. A new faith, based in the genuine compassion of the Religious Left, is waiting in the wings. Step aside, and let us heal what you have broken. We'll never know if that's really what Obama thinks but it sure sounds right to me, a guy who twice made the mistake of voting for George W. Bush. I'm still leaning towards Obama but I'm not 100% committed as I'm waiting to see who he picks for a VP (please, not Evan Bayh!) and what specific plans he has to fix the limping economy. This book has also helped open my eyes a bit wider as I realize the faith part of the equation isn't as clean and simple as I previously thought. P.S. -- If you'd like to read an extended sample of The Faith of Barack Obama, click here to download the PDF version the book's publisher (Thomas Nelson) graciously allowed bloggers to post. I wasn't aware of this new book called The Faith of Barack Obama until I read about it on Michael Hyatt's blog. I read (and reviewed) one of Obama's own books, The Audacity of Hope, earlier this year. I admit it. I'm definitely leaning towards voting for Obama even though I also have a lot of respect for John McCain. I'm curious to read what author Stephen Mansfield has to say about Obama's faith though, so this one just got added to the top of my "must read" list. UPDATE: Thanks to CEO Mike Hyatt and the PR team at Thomas Nelson I'm now able to post and share the 48-page sample of The Faith of Barack Obama noted in this post. I read this sample and am very much looking forward to reading the rest of the book when it arrives. If you'd like to read the sample as well just click here to download it. Wow. What a truly amazing book. As the saying goes, if you're only going to read one book this year, The Shack should be the one. I just finished reading it on my Kindle and I can't tell you the last time I was this inspired by a book. What's so special? It's the only book I've ever read that personalizes God. More specifically, this riveting story paints a fascinating picture of each element of The Trinity, all in human form. As a parent it was tough to read at times...I won't go into the reason why here...you'll just have to read it for yourself. The mental images from The Shack will probably be the lens through which I will read every other book on Christianity in the future. That's saying a lot but it still doesn't do this book justice. Buy it and read it. You won't regret it. My church recently featured a series of very effective service messages based on the book Death by Suburb. I figured if the church services were this insightful, well, the book itself must be fantastic. My assumption was right. 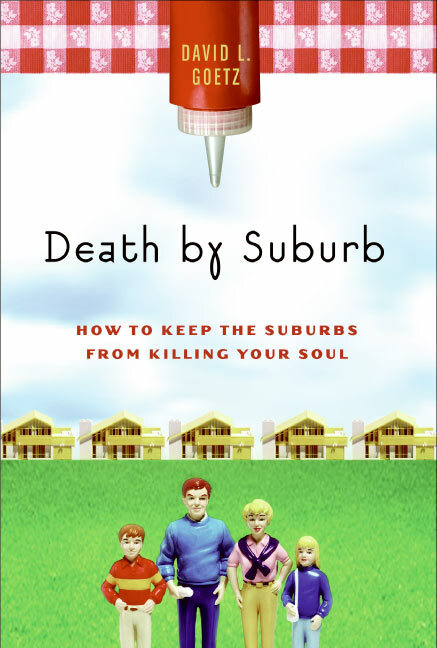 The subtitle of the book is "How to Keep the Suburbs from Killing Your Soul." While Goetz's message is important to hear it's most effective when you project his observations on your own life. Some of this stuff was pretty darned painful to read but 100% accurate. I want to make a difference with my life. I want to make my life count. I want more from my life than investment banking. I'm weary of making money; I want to help poor people become suburbanites just like I am. He goes on to say that "the Shirker Life is full of service activities, mostly to and with other Shirkers." Ouch. If you want to be a sweet grandfather and not a bitter old man, then you must learn how to embrace suffering. Frustration and conflict are the fabric of spiritual development. Those are the kind of statements I have to read several times to truly appreciate them. Putting them in practice and living them are a completely different challenge. This book is full of pearls like this and well worth the reading investment.